Terence McKenna frequently used the phrase “dissolution of boundaries”. The meaning that I give to it may be a little bit different than what McKenna had in mind, but in essence it is the same. Life is One, and everywhere you look, you can take away the veil of separation. Not in a visual way, but in a mental way. Things are not really separated; it only appears like that to our senses. Today I realised that the separation between my work as a painter/handyman and my so-called more creative work is also just an idea. Today I made sketches of some bookcases, that I am going to make for friends; I made a TypeFace for somebody who helped me to a job as a painter and I made a logo for somebody in whose house I painted some doors and door frames. There are days when it seems that the different things I am doing, are not compatible, but on days like this it is clear that it is a perfect combination. The only “problem” is that I complain too much about it. 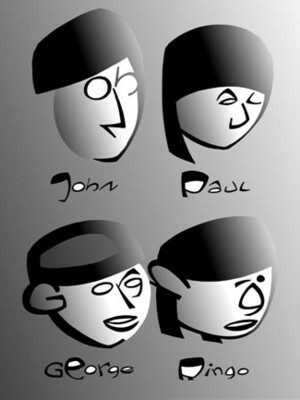 My brother has made a coloured version of the Beatles TypeFaces. This will be part of the quartet that we will try to publish as postcards, T-shirts or whatever. I am very happy with the result. It looks so much better than the black&white versions that I did. 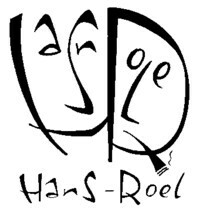 Apart from the TypeFace for Hans-Roel, I haven’t made any new ones recently, and I have no plans to do that either. At the moment I want to write letters, with pen & paper, about everything that pops up in my mind. I am afraid that some of that will leak into this Soundtrack, but I will try not to bother you too much with it. Although I do like the fact that this blog is not only about music, music still is the basis. Today I was listening to some music that has piled up on my desk over the past few days and again I realised the importance of music in my life. Here is an interesting version of Rocking ‘round the Christmas tree by The Rubber Band. It is a different version than the one by The Fab Four. I like that one better, but the lead singer of The Rubber Band sounds more than the singer he is imitating than the singer of The Fab Four. I hope that I won’t have nightmares of writing about this stuff for the rest of my life. I have a feeling that it is getting a bit out of hand.